Cat at Heart by Tanya: Trending: EleMINTs of Style! Sportsgirl Rolled Neck Sweater in Mint (buy here) In the early stages of Spring, the brisk Sydney weather can be a little hard to manage without a jumper so why not a oversized, mint one? This one is perfect for staying warm while looking ready for the the vibrant Spring. Topshop Mint Lace Trim Ankle Socks (buy here) Frilly socks are perfect for any outfit. They are super cute and it makes me feel like i'm four or five again! I like how you can pair these with converses, vans or creepers and they instantly makes your outfit more feminine! Lime Crime Lipstick in Mint To Be (read here) It is devastating that this lipstick was limited edition and is now sold out. But that didn't stop me from featuring it in this collage because I think the colour is spectacular. It is true that if I get it, I will probably wear it once in a blue moon for a photoshoot or a special dress up event but it is still wonderful and a must have for all you lipstick fanatics! "Everything Is Going To Be OKAY" Book (buy here) This book is a perfect pick-me-up whenever someone is down. It is filled with inspiring words from photography, to paint, to pen and ink illustrations that would bring back the sunshine and spark into someone's life. A must have, even though it may not be exactly a fashion/beauty item. Goldie Marina Dress in Mint (buy here) Florals, studded collars and mint. This dress has definitely gotten it right. The vibrancy of the colours with the added edge from the studs creates a perfect combination for a Spring dress. The shape of the dress is easy to pull off for all body shapes and the cinched in waistline is super flattering. Definitely a must-need in a wardrobe! Essie Nailpolish in Mint Candy Apple (buy here) Who hasn't heard of this nail polish? This colour has been featured by so many beauty gurus and bloggers that I feel like everyone know everything about it without physically owning one. Having mint on the nails is perfect for anyone who wants to incorporate some bright colours in the outfit without looking too overly bright and taking too much fashion risks. Jeffrey Campbell Night Walk in Mint Suede (buy here) Mr. Campbell... Why? Why do you have to make the most perfect shoes that are so damaging to my bank account? Mary Janes have always been my choice of heels because they are a classic and look so adorable but these take things to a whole new level. These heeless heels are so cool and are said to be incredibly easy to walk in so they are just magnificent. Yves Saint Laurent Arty Gold-Plated Glass Ring in Mint Glass (buy here) Is it still alright for me to call it Yves Saint Laurent, or do I have to call it Saint Laurent Paris? Anyhow, this ring is simply incredible. Unfortunately, like every other successful thing in the world, there are plenty dupes for this ring but there is just nothing like the original. If it wasn't for the expensive price tag, this would've already been mine! Nasty Gal Astro Circle Shades in Mint (buy here) It's time to find the sunglasses, ready for the sunglasses seasons! Once again these are quintessential for the spring time because the circle frame glasses with omber amber coloured lenses are perfect with almost every outfit and are flattering with all face shapes! I ♡ MINT! I ♡ MINT! I ♡ MINT! I ♡ MINT! I ♡ MINT! I ♡ MINT! I ♡ MINT! I ♡ MINT! I ♡ MINT! I ♡ MINT! I ♡ MINT! Only for those who haven't figured that out yet :-). Hope you all have a lovely weekend. It's Friday. Friday. Gotta get down on Friday. PEACE OUT! i love this color so much!! 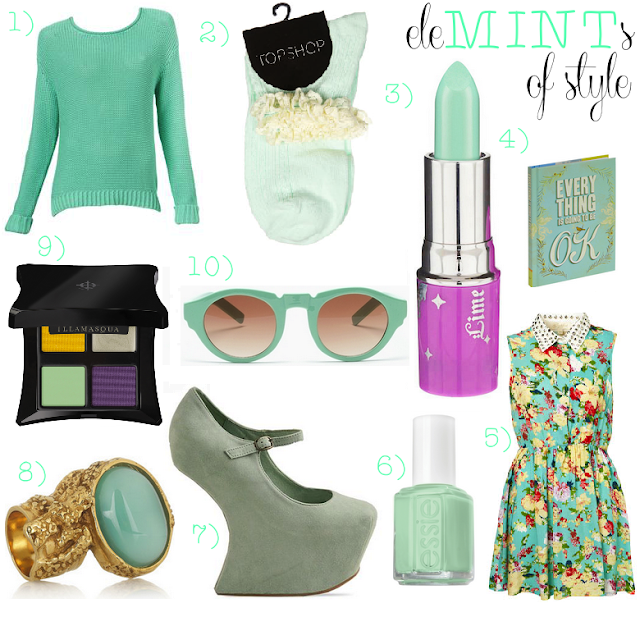 I am so in love with mint right now! I really want the essie nail polish seen so many lovely things so it! Great post! WOW ! The lipstick !